We had a great time last month hosting the 2018 International Association for Shell and Spatial Structures at our home on MIT campus! Caitlin Mueller was the Chair of the Organizing Committee for IASS 2018, joined by John Ochsendorf of MIT, Sigrid Adriaenssens of Princeton University, Bill Baker of SOM, and John Abel of Cornell University. Much of the conference took place in Eero Saarinen’s iconic Kresge Auditorium. Throughout the conference we enjoyed outstanding speeches from our plenary speakers. Stay tuned for our next blog posts featuring some of the interviews with our plenary speakers that we published in our abstract book. Plenary speaker Janet Echelman, artist and principal of Studio Janet Echelman. Plenary speaker John Ochsendorf of MIT and American Academy in Rome. Plenary speaker Tomohiro Tachi, associate professor in graphic and computer sciences at the University of Tokyo. Plenary speaker James O’Callaghan of Eckersley O’Callaghan. Plenary speaker Chuck Hoberman of Hoberman Associates. 56 technical sessions took place throughout the week, where 450 papers were presented. We also introduced two new events to IASS: a panel on women in design and engineering, and a young designer’s mentorship lunch. These were made possible by Thornton Tomasetti and SOM, respectively. The panel on women in design and engineering was moderated by Maria Garlock, professor in civil and environmental engineering at Princeton University. Panelists included Mariana Ibanez of I-K Studio and MIT (podium), Alloy Kemp of Thornton Tomasetti (third from right on stage), Lucile Walgenwitz of Guy Nordenson and Associates (second from right on stage), and Jane Wernick of engineersHRW (far right on stage). Attendees of the panel were asked to submit and vote on questions to ask the panelists via a live portal. At the Young Designers’ Mentorship Lunch, conference attendees enjoyed interfacing with peers and mentors at randomly assigned tables over lunch. The Young Designers’ Reception sponsored by Guy Nordenson and Associates took place on the 6th floor of the MIT Media Lab. Attendees enjoyed dinner with views of the Boston skyline and live music performed by Digital Structures’s Demi Fang on the violin. The conference ended with an evening cruise on the Boston Harbor. Not pictured are the workshops that kicked off the conference and the technical tours that were given throughout the New England area. … and a final shoutout to Danniely Staback who made many aspects of the conference possible and successful! IASS 2018 would not have been made possible without the support of our sponsors. Thank you! Photos by Julia Irwin unless otherwise noted. Stay tuned on IASS 2018’s Facebook page for more photos. Digital Structures enjoyed a fruitful academic year. We wanted to share some of our highlights with you as well as some events we're looking forward to in the future. To kick off the Fall 2018 semester we enjoyed kayaking on the Charles. We welcomed new members Demi, Moh, Courtney, Hanne, and Felix and said good-bye to Valentina in the spring. Caitlin, Nate, and Paul enjoyed presenting at IASS 2017 in Hamburg (news / blog). We also enjoyed presenting and representing Digital Structures at several other conferences around the world, including the Design Modeling Symposium Paris, Chicago Architecture Biennale, and the International Mass Timber Conference. A design team led by Valentina won first place in the Mars City Design 2017 Competition for Urban Design. We also enjoyed both hosting and presenting at ACADIA 2017 on our campus. Finally, we enjoyed hosting and interviewing guest lecturers such as Les Robertson and SawTeen See in our 6th annual Edward and Mary Allen Lecture in Structural Design, glass artist Sophie Pennetier, Professor Christopher Robeller of TU Kaiserslautern, and Martha Tsigkari of Foster + Partners. This spring two of our members are graduating: Yijiang and Brenda. Yijiang completed his thesis for a Master's of Science in Building Technology on "Automated Motion Planning for Robotic Assembly of Discrete Architectural Structures", and Brenda completed her thesis for a Master's of Engineering in Civil Engineering on "Minimizing Embodied Carbon in Multi-Material Structural Optimization of Planar Trusses". Congratulations! Coming up, we're excited to hold a workshop on active bending simulation at AAG 2018 and to present on robotic extrusion at RobArch 2018. Hope to see you in July as we host IASS 2018 here on our own campus! Structural engineer Sophie Pennetier has worked on a wide range of specialty structures ranging from the National Museum of African American History and Culture to the Mexico City Airport in firms such as RFR, Guy Nordenson and Associates, SHoP Construction, and Arup. Beyond this accomplished track record in structural engineering, all within ten years of graduating from university, Pennetier has already begun to challenge the boundaries of the role of the engineer. A recipient of the Jerry Raphael fellowship from the Metropolitan Contemporary Glass Group and Urban Glass Brooklyn in 2016, Pennetier was awarded the opportunity to explore the possibilities in cold bent ultra-thin glass and to apply the knowledge as her own “designer, engineer, and maker” of a small glass sculpture. The process was additionally supported by Corning Inc, Coresix Inc, and Arup. Pennetier stopped by MIT in early October to give us a presentation on “Shaping Ultra-Thin Glass.” She shared with us the process of developing of her project, including steps such as testing, design, analysis, and fabrication. She also (bravely) entrusted us with handling a few samples of the glass to feel its flexibility. We sat down with her afterwards to chat about her experiences, her career, and her thoughts. Pennetier presents her work in ultra-thin glass to master's of architecture students in Prof. Caitlin Mueller's Building Structural Systems II class. As elegant as her sculpture is, the project also represents an innovative step. “Ultra-thin glass is particularly lightweight, clear, and scratch-resistant. Corning invented this material decades ago and yet at the time there was no application for it. In parallel, at least two markets are interested in the material: the automotive industry and the electronics industry. The automotive industry is looking to make lighter cars that are still robust enough for security, while the electronics industry is interested in making lighter, clearer, scratch-resistant electronics with the glass.” Pennetier explains that as a company, Corning maintains a hopeful eye on steering the material into the automotive market, which will likely have a quicker and larger return investment than the field of architecture. In contrast, buildings using this material may remain few and far between for now. Pennetier maintains this social awareness for her future work in ultra-thin glass. “We have glass everywhere, and it is getting thinner in all industries. Ultra-thin glass may take a lot of energy to fabricate, but it is recyclable and lighter than regular glass, coming in spools that make it easier to transport during the manufacturing process. There is potential to use this material to make processes greener. What’s next for me is ensuring there is a viable social context for this material. My sculpture succeeds as a mechanical prototype, but we still need to make sure it has a meaning for our buildings. Members of the Digital Structures research group recently participated in the 2017 Symposium of the International Association for Shell and Spatial Structures in Hamburg, Germany. This conference brought together researchers from all over the world interested in topics such as digital design technology, shell and membrane structures, deployable structures, and conceptual structural design. From MIT, Nathan Brown first presented his research on how to use data analysis techniques to automate and simplify early-stage, performance-based design spaces. 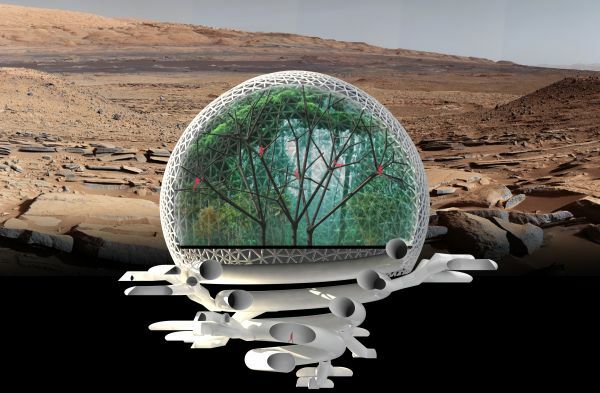 Next, in a session about inflatable structures, Prof. Caitlin Mueller gave a talk about her research with Valentina Sumini into formfinding for deep space habitats, which could eventually be used to house communities on the Moon or Mars. Finally, after patiently waiting until the last day of the conference, Paul Mayencourt presented his recent work on shape optimization of timber beams, which has the potential to reduce weight and environmental impact in what is perhaps the most commonly used structural member (although columns may have a thing or two to say about that). The conference also gave Digital Structure members the opportunity to visit historic and contemporary structures in both Hamburg and Berlin. Highlights in Hamburg included the Philharmonie, a glass roof for the central bus station, and a tour of the Hamburg Grossmarkt, a historical concrete roof from 1962, which was organized by the conference. These tours, which often involved a crowd of people exiting a seemingly non-descript, 50-year-old concrete subway station, and then turning around and dodging traffic while trying to get a good picture, must have been curious sight to the locals. Berlin also contains many interesting buildings and structures to visit, such as the Sony Center roof, the House of World Cultures, the renovated Olympic Stadium, and the dome on top of the Reichstag building. It also offered the opportunity to visit in person the East Side Gallery, which was the site of a recent Digital Structures bridge design competition submission. As a result of an utter lack of planning, climbing the Reichstag dome was only possible due to a fortuitous, last minute visitation slot opening up at the perfect time. German security must have sensed two young, bright-eyed structural designers who would jump on the opportunity. Digital Structures members also spent much of the symposium gaining inspiration for how to best organize IASS 2018, which will be held in Boston next July. We are looking forward to hosting next year’s symposium at MIT, and welcome all who are interested in these topics to submit papers and consider participating in the workshops, talks, and other events that will take place next year!